Now, we could use this post to explain why we think you’ll be glad you joined the QB Community. Instead, we’ve decided to turn things over to some of the dedicated, passionate, hard-working entrepreneurs already benefitting from being part of the QB Community. Here, in their words, are five great reasons to join our community today. Sure, you work for yourself. That doesn’t mean you have work by yourself. Whether you’re celebrating a new customer, solving an inventory problem or venting your frustration about a late payment, you’ll be cheered on -- or cheered up! – by others in our supportive community. When you work for yourself, you have to figure out a lot of things on your own. This community can help you find shortcuts for everything from tracking your finances and marketing your product to hiring employees and connecting with the perfect supplier. Nothing beats learning from someone who’s been there, done that. No matter what stage of business you’re at – thinking about it, just starting out, already up and running or focused on growing and scaling – countless others in our community know just what it takes to you get to the next level. "It’s my belief that the more we work together, the more we succeed. I hope that by contributing to this community, and sharing my successes and my failures, I might be able to pay it forward just like others have done for me." We all have days when a little inspiration goes a long way. That’s why we love shining the spotlight on small business owners who tirelessly rise to every challenge, solve unexpected problems and work around the clock to make their business dreams come true. If you’re looking for inspiration, QB Community has it in spades. You know it takes a certain mindset to make it as an entrepreneur. In this community, we get it – which means we get you. 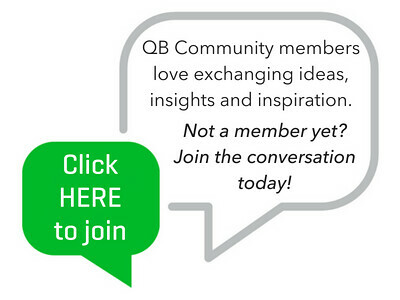 Want more information about the QB Community? Here are four helpful posts. Welcome! Check out our community guidelines and meet the team. I'm looking forward to welcoming you to the QB Community! Thank you Leslie for gathering insight from fellow small business owners to share here on this platform. It's incredible to connect with others and hear their stories, it builds a sense of community when often you are working solo and behind the scenes. @LeslieBarber, I especially love #3, "Our Members are Caring". This is SO true! I love the way everyone not only cheers each other - they take the time to share their expertise and experiences as well. It's really awesome and makes me very proud to be a part! I couldn't agree more @JulieatTheWELL! Thank YOU for sharing your learnings with us in your Momentum to $1M group!! It’s my absolute pleasure @LeslieBarber! Cheers and Big Mo!! I've never experienced anything so difficult to navigate. I have a QB Pro Descktop license. I want to ask the community a question. In your article anytime I click on a link to join the community it takes me back to the community home page or a page offering 50% off a product. Why isn't ther some clear direction on how to post a question. the link you have just take you to page to buy quickbooks for 50% off- wothless.